The time-honored Change of Command is a military tradition representing a formal transfer of authority and responsibility from one commanding officer to another. The passing of colors and standards, to an incoming commander, ensures that the unit and its soldiers are never without official leadership. On Wednesday, cadets from Pahrump Valley High School’s JROTC program carried out the ritual along with the pageantry that goes with it. 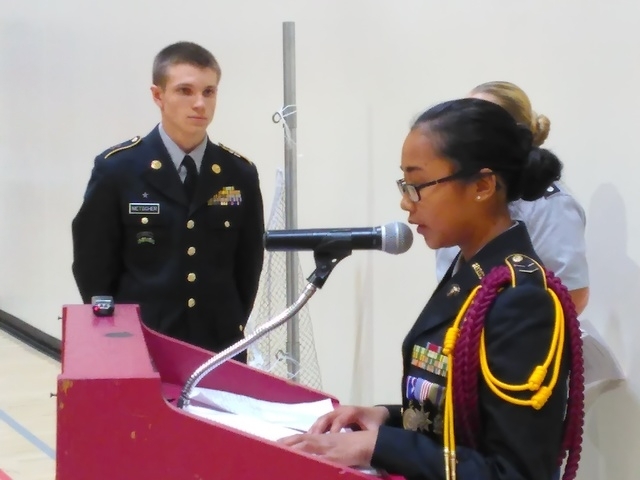 As such, Battalion Commander Cadet Lieutenant Colonel Fanny Descuatan relinquished command to Cadet Lieutenant Colonel Dylan Metscher, who will lead the cadets for the 2016-17 school year. ROTC Commander Lieutenant Colonel Patrick Nary spoke about Descuatan’s leadership role this year. Conversely, Nary also addressed the responsibilities incoming commander Metscher will assume this fall. Following the ceremony, Metscher said the new position comes with many responsibilities. As for Descuatan, she will undergo basic training at Fort Sill in Oklahoma later this year, where she also plans to earn a college degree. Nary meanwhile, spoke about how the program fared throughout the school year. Each cadet signed a contract committing themselves to servicing their school and the community at large. Nary also spoke about the future of several of the graduating cadet seniors in the program.